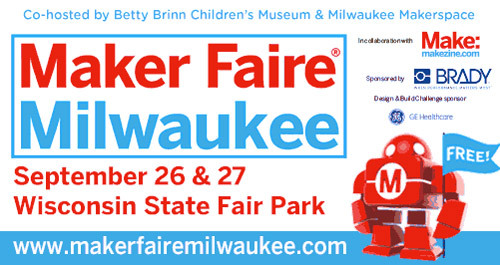 While I’ve been posting a lot lately about plastic and other odd things, pretty much all of my time these days has been filled with planning Maker Faire Milwaukee. What I love about Maker Faires (I’ve attended about eight of them in various cities the past few years) is that the people who share their work (or play) are passionate about what they do, and they love sharing it with others. I find this inspiring, and I usually leave excited about what I saw, and eager to learn new skills and make new things. If you want a preview of what you’ll see, check out some of the blog posts I’ve been writing. Posted on Wednesday, September 2nd, 2015 at 8:00 am. Subscribe to the comments feed. Both comments and pings are currently closed. Post on your own blog.